As all seasoned traders know, oil futures contracts reflect the market’s probability-weighted price expectations. In addition, I believe that the market provides a risk premium to the long side which under-prices oil to some extent. Before going further, there is no definitive financial theory or procedure of telling specifically. So I have to make some informed guesses based on possible outcomes and past market reactions. Based on economic theory, commodity producers predominately use futures markets as "price insurance" for future sales. This theory was published more than seventy years ago by economist John Maynard Keynes in his seminal book, Treatise on Money, about hedgers' and speculators' positions in futures markets. The Commitment of Traders (COT) report, published by the Commodity Futures Trading Commission (CFTC), has consistently shown that crude producers are net short and speculators are net long. As with any insurance policy, the insured must pay a "risk premium." In options markets, the risk premiums can be directly observed by the price quotes for puts and calls. In futures markets, they are not transparent. They represent the difference between the market's "expected" future spot price and the price of the futures contract. Because there is no quote for "expected" future spot prices to compare to futures, it cannot be directly measured. But the theory is that crude futures prices must be undervalued to some degree to lure speculators into providing the insurance for an expected gain. Insurers only provide insurance for an expected profit. Casinos only take bets if they have the "house" odds of winning. There have been several important events this past year which help provide information on what prices to expect based on OPEC announcements. When Saudi Arabia was still pursuing its battle for market share early in the year, crude prices had fallen below $30 in February. 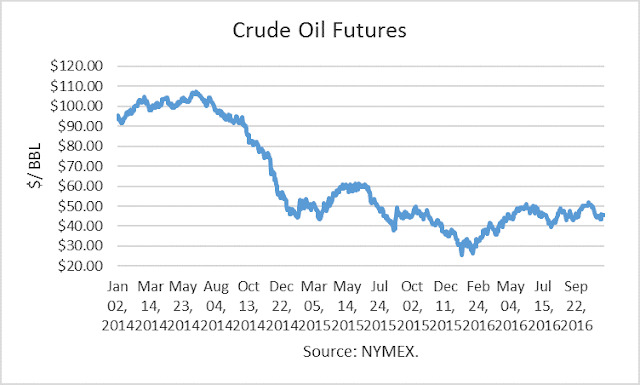 NYMEX Crude Oil Futures However, an announcement of a possible “freeze” in production among key producers, notably Saudi Arabia and Russia, served to reverse the downward price trend. In my opinion, the rebound was not really because traders expected the supply-demand balance to change radically in the short-term. Instead, random announcements created “headline risk” for short speculators, unfavorably altering the risk-reward of being short. Subsequently, they covered their short positions, causing a rally to over $40/b by mid-April, in front of the scheduled Doha meeting, which was supposed to produce the freeze agreement. But Iran failed to attend, as it had been saying, on the basis that it would not freeze its production until it was restored to pre-sanction levels. The meeting ended in a glaring failure. Prices would have collapsed then, had it not been followed by the confluence of oil disruptions in various areas of the world, beginning with Kuwait (strike) and extending to Nigeria (attacks) and Canada (wildfire). As a result, prices breached the $50 barrier due to the disruption of more than 3 million barrels per day. As production was restored, prices again came sliding down and briefly broke through $40 again. At that point in early August, OPEC released a press statement that the ministers would meet again at the end of September to address the on-going oversupply issue. That statement was followed-up by random statements from Russia and the new Saudi energy minister, sparking mini-rallies, once again altering the risk of maintaining a short position. By mid-to-late August, crude prices had reached $49, and the new Saudi minister announced that “there is no price war,” essentially reversing their market share, price war strategy. No new agreement appeared to be taking shape, and prices dipped to the mid-$40s. Then the oil ministers gathered and unexpectedly announced an agreement to limit production to 32.5 to 33 million barrels per day. However, it gave itself two months to determine which producers would cut production, by what amount, which is the critical issue. Prices nonetheless reach $52/b. At the end of October, OPEC’s High-Level Committee met to address the issue, as tasked by the OPEC ministers. The meeting ended without agreement. Prices dropped to the lower $40s following that news and that OPEC production had risen to over 33.6 million barrels per day. Russia’s output also surged to over 11 million barrels per day. This week, OPEC could still not resolve the production allocation issue, though there were pronouncements about how close they were to an agreement. Libya and Nigeria have been “exempted” due to their production having been disrupted. Iran and Iraq want the same exemptions, but they have not been granted. Given these developments, it seems unlikely that OPEC will achieve a transparent agreement that provides cuts to reduce output to the target range. However, announcing a complete failure would drive prices below $40/b, in my opinion. As a result, I think they will announce an agreement that is less than clear-cut to keep prices from collapsing. The agreement could say that they will meet monthly to determine output. This would maximize the “risk premium” of the uncertainty without actually having to cut production. Given the foregoing price moves this year, I would expect prices to rise to the low $50s if they announce some sort of agreement, but then to drop back into the $40s as it becomes clear they are not limiting output. If output from Libya and Nigeria is restored as they hope, and Iran and Iraq each increased their output by several hundred thousand barrels per day, the $40 floor may not hold in 2017, as the glut will become even larger than in 2016.